Consumers may not always see a product as it is. Garvin identified consumer’s perception of a product, also known as ‘quality’, as a dimension that could not be defined precisely. It does not only based upon the technical values of a product, but also how the consumers interpret it. By Aaker’s definition on quality, the differences lay in the bases used in determining the quality of a product. A product can have a low performance and still perceived positively, depending on its consumers. In this paper, we will discuss various aspects that make those deviations possible, which include perceived quality and brand associations. Keller mentioned that consumers’ perception on the superiority of a product in a category vary, depending on how the consumers see the product. The satisfactory level a consumer has when consuming a product compared to its alternatives in regards to its intended purposes is what he later defined as perceived quality. The concept of perceived quality covers what Garvin previously argued, that several aspects of a product’s quality tend to be subjective. This concept mainly discusses how consumers see a product beyond its functional performances. Consumers’ beliefs of several general dimensions of a product, which include primary ingredients and supplementary features; product reliability, durability and serviceability; and style and design, often define its quality. In the long run, how customers perceived those characteristic in a product will influence their attitudes and behavior in toward a brand. This then will be a determining factor of brand image in consumers’ minds. As Keller had explained, perceived quality is the most important aspect in determining consumer value and satisfaction. It is the main key in building brand equity. Aaker’s view on perceived quality placed the concept as a structure made out of more specific elements of brand identity. It resonates consumers’ perceptions on various aspect of brand identity, seeing the product subjectively depending on their knowledge and experience. It differs itself from objective quality which only includes its intended functions, but severely dependant upon the products’ category. 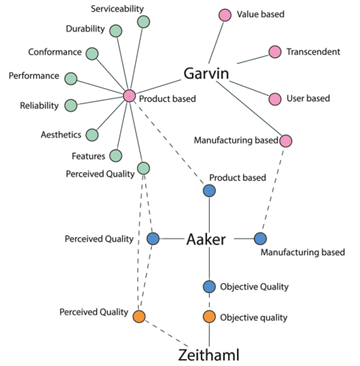 Based on the characteristic of perceived quality, Aaker identified four dimensions for its measurement: high quality versus shoddy quality, best in category versus worst in category, consistent quality versus inconsistent quality, and finest quality versus average quality versus inferior quality. The quality measured is a combination of consumers’ perception of the products’ functions, experience, knowledge, and their brand relationship status. A brand’s status in the market as well as its marketing communications strategy become its point of differences that will make customers’ perceptions vary in this category. 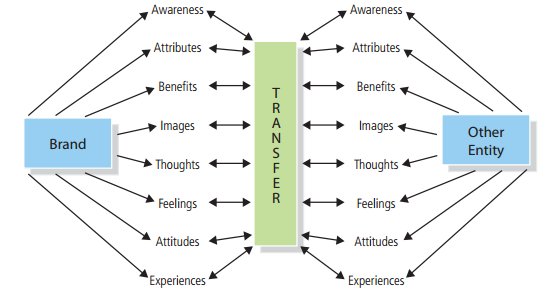 Consumers’ perceived quality is based on how the product is associated in consumers’ minds. A number of communication practitioners found alternatives in building brand equity which include borrowed interests. Borrowing Keller’s argumentation, leveraging the product with secondary associations will increase consumers’ perceived quality of the product, depending on the associations. The first associations a brand have is directly related to the product, whereas the leverages Keller mentioned include other entities that have their own associations, such as the company (through branding strategies), countries or other geographical regions (through identification of product origin), and channels of distribution (through channel strategy), as well as to other brands (through ingredients or co-branding),characters (through licensing), spokespeople (through endorsements), sporting or cultural events(through sponsorship), or some other third-party sources (through awards or reviews). The secondary associations allow brands to form a mental connection with its consumers through the borrowed interests. It allows consumers to make brand decisions based on secondary considerations such as what they think, feel, or know about the country from which the product came, the store in which it is sold, or some other characteristic of the associations. However, when a brand is linked with other associations, it affects consumers’ knowledge of the brand. Consumers may infer that a brand shares associations with it’s leveraged entity, which can affect perceiver quality in both positive and negative manner. In leveraging brand associations, Keller pointed out three indicators that must be met by the other entities. First, awareness and knowledge of the entity. The secondary entity must have high level of knowledge and awareness so that the consumers can be aware, hold strong, favorable, unique associations, and have positive judgement or feelings about it. Second, meaningfulness of the knowledge of the entity. The purpose of leveraging brand associations is to build positive consumers’ perceptions, without leaving the brand itself. The entity, therefore, have to share relevant meaning with the brand so that it can build strong impression in consumers’ mind. Last, transferability of the knowledge of the entity. Useful associations should be considered only if it can be transfered to the brand and therefore increase its perceived quality. Hafee Ur Rehman, “Consumer Perception with Respect to Perceived Quality and Brand Association”, archived in https://www.researchgate.net/publication/236618349, accessed April 20 2016. In Konstantinos Stylidis, et.al., “Defining Perceived Quality in the Automotive Industry: an Engineering Approach”, archived in www.sciencedirect.com/science/article/pii/S2212827115006034, accessed April 20 2016. Kevin Lane Keller, Strategic Brand Management: Building, Measuring, and Managing Brand Equity (Fourth Edition), (Essex: Pearson Education Limited, 2013), pg. 187. Kevin Lane Keller, Op.Cit., pg. 187. David A. Aaker, Building Strong Brands, (New York: The Free Press, 1996), pg. 324. David A. Aaker, Op.Cit., pg. 324. Kevin Lane Keller, Op.Cit., pg. 60. David A. Aaker, Op.Cit., pg. 326.